Discovering sounds in Patagonia: characterizing sei whale (Balaenoptera borealis) downsweeps in the south-eastern Pacific Ocean Sei whale vocalizations in Chile Sonia Español-Jiménez et al. The sei whale (Balaenoptera borealis) is one of the least known whale species. Information on sei whale distributions and its regional variability in the south-eastern Pacific Ocean are even more scarce than that from other areas. Vocalizations of sei whales from this region are not described yet. This research presents the first characterization of sei whale sounds recorded in Chile during the austral autumn of 2016 and 2017. Recordings were done opportunistically. A total of 41 calls were identified to be sei whale downsweeps. In 2016, calls ranged from an average maximum frequency of 105.3 Hz down to an average minimum of 35.6 Hz over 1.6 s with a peak frequency of 65.4 Hz. During 2017, calls ranged from an average maximum frequency of 93.3 down to 42.2 Hz (over 1.6 s) with a peak frequency of 68.3 Hz. The absolute minimum frequency recorded was 30 Hz and the absolute maximum frequency was 129.4 Hz. Calls generally occurred in pairs, but triplets or singles were also registered. These low-frequency sounds share characteristics with recordings of sei whales near the Hawai'ian Islands but with differences in the maximum frequencies and duration. These calls distinctly differ from sounds previously described for sei whales in the Southern Ocean and are the first documented sei whale calls in the south-eastern Pacific. Español-Jiménez, S., Bahamonde, P. A., Chiang, G., and Häussermann, V.: Discovering sounds in Patagonia: characterizing sei whale (Balaenoptera borealis) downsweeps in the south-eastern Pacific Ocean, Ocean Sci., 15, 75-82, https://doi.org/10.5194/os-15-75-2019, 2019. The sei whale (Balaenoptera borealis; Lesson 1828) is the third largest rorqual in the Balaenopteridae family, after the blue whale (B. musculus) and the fin whale (B. physalus). It is also one of the least known whales. The sei whale is a cosmopolitan species found in temperate oceans and subpolar areas (Mackintosh, 1942; Gambell, 1968; Rice, 1998; Horwood, 2002; Reeves et al., 2002; Jefferson et al., 2008). It prefers deep offshore waters with temperatures below 20 ∘C and avoids semi-enclosed bodies of water (Omura and Nemoto, 1955; Gambell, 1985). North Atlantic, North Pacific, and Antarctic populations are almost certainly separated and probably subdivided into geographic stocks (Horwood, 1987; Baker et al., 2004; Kanda et al., 2006; Huijser et al., 2018). The International Whaling Commission in 1991 divided the global sei whale population into “stocks” (based on the distribution of catches, sightings, and mark–recapture data) for management purposes (Donovan, 1991). However, genetic studies provide a different population distribution. For example, in the North Atlantic Ocean, the sei whale population from Iceland, the Gulf of Maine, and the Azores shares the same genetic diversity, showing the wide latitudinal and longitudinal ranges in which they moved. Furthermore, the genetic divergence between North Pacific and North Atlantic stocks is well known, but no studies of this genetic structure between hemispheres or within the Southern Ocean have been presented (Huijser et al., 2018). In the Southern Hemisphere, sei whale sightings have been recorded from the Subtropical Convergence to the Antarctic Convergence, but the only observation records of adult animals come from the south of the Antarctic Convergence in austral summer (Gambell, 1974; Lockyer, 1977). In general, sei whales migrate seasonally from the reproduction areas in low latitudes in winter to their feedings areas in high latitudes in summer (Reeves et al., 1998). Reproduction areas are poorly known (Perry et al., 1999) and feeding areas show great variability between years (Jonsgård and Darling, 1977). Population boundaries and migratory patterns are also poorly understood. In the austral summer there are concentrations of sei whales between 40 and 50∘ S; older, larger individuals tend to travel to the northern Antarctic, while smaller, younger individuals tend to stay at lower latitudes (Rice, 1998; Acevedo et al., 2017). Because of their smaller size, speed, and elusiveness, sei whales were comparatively less important as target species for hunting until the early 1960s. After the decline in the most profitable species such as blue whales, fin whales, and humpback whales, the whaling industry increased the hunting pressure on sei whales (Gambell, 1985). Thirty years ago, between the Antarctic and the North Pacific, many whales were taken from the coasts of Peru and Chile (Tonnessen and Johnsen, 1982). Most captures were carried out by pelagic whaling in the Antarctic, which hunted more than 110 000 sei whales between 1960 and 1970 (Horwood, 2002). The International Whaling Commission estimated the size of the sei whale populations in the South Hemisphere to be 37 000 individuals after the cessation of commercial captures in 1984, while this number was estimated to be 191 000 in the 1940s (Gambell, 1985). Between 1929 and 1983, sei whale captures represented 17.3 % of the total catch of whales in Chile. It was the third most hunted species, with approximately 1664 individuals captured principally on the north and central coasts (Aguayo-Lobo, 1974; Aguayo-Lobo et al., 1998), although these include an unknown number of Bryde's whales (Valdivia et al., 1981; Gallardo et al., 1983; Aguayo-Lobo et al., 1998). After the whale-hunting moratorium imposed by the International Whaling Commission in 1980, several research projects focused on the populations and recovery status of large whales such as right whales, humpback whales, blue whale, and fin whales (Reeves et al., 2002). Since 1976, sei whales have been listed as endangered (IUCN, 2018). Today, sei whales are the least studied of the large whales, and there has been a lack of data since the end of the commercial hunting (Prieto et al., 2011). In Chile, there are opportunistic sightings and strandings of sei whales from Antofagasta (in the north) to the Magellan Straight (in the south), including the islands of Juan Fernandez (Gallardo et al., 1983; Schlatter, 1987; Aguayo-Lobo et al., 1998; Findlay et al., 1998; Pastene and Shimada, 1999; Guzmán, 2006; Acevedo et al., 2017). Many sightings in Central Chile and northern Patagonia (33–48∘ S) have been reported since 1966, when 286 whales were sighted in March of 1966 (between 43 and 45∘ S) and 114 in October of the same year (between 46 and 48∘ S), all between 30 and 190 km off the shore (Aguayo-Lobo, 1974). In March 1968 Japanese whalers reported the sightings of several hundreds of sei whales between 46∘ 40′ and 48∘ S, with a peak concentration 30 km off the coast of the Tres Montes Peninsula at the northern limit of the Penas Gulf (Pastene and Schimada, 1999). In 2015, at Penas Gulf the largest recorded baleen whale mass mortality event was reported, with 363 registered carcasses of baleen whales (Häussermann et al., 2017). Genetic and morphological analysis confirmed that the examined animals were sei whales (Häussermann et al., 2017). These historical sightings support the hypothesis of Guzmán (2006) about the presence of sei whales feeding in Chilean Patagonia between Chiloé Island and the Magellan Strait (Acevedo et al., 2017). Since the sei whale is endangered and poorly known, population studies are crucial as a support for its conservation. Autonomous passive acoustic monitoring devices facilitate the monitoring of cetaceans by recording their vocal signals. Passive acoustic data can then be used to characterize and understand the whales' acoustic behaviour and determine their distribution patterns in time and space (Clark and Ellison, 1989; Richardson et al., 1995). 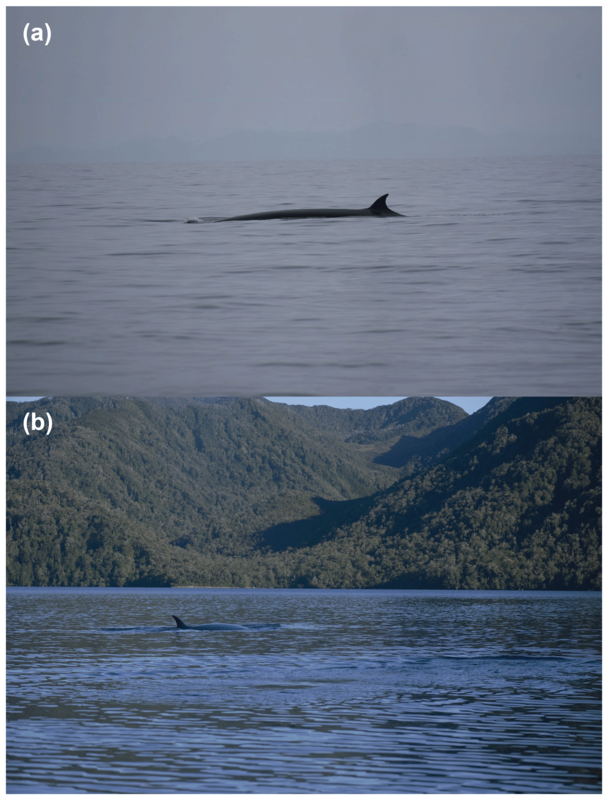 Acoustic signals produced by sei whales are poorly known (Prieto et al., 2011). To date, vocalizations have been described from six different geographic areas: New England (USA), Nova Scotia (Canada), Hawai'i (USA), Azores (Portugal), Auckland Islands (New Zealand), and the Antarctic Peninsula (Thompson et al., 1979; McDonald et al., 2005; Rankin and Barlow, 2007; Baumgartner et al., 2008; Calderan et al., 2014; Romagosa et al., 2015). There is no record of sei whale vocalizations from the south-eastern Pacific Ocean. Comparison of intraspecific sounds from different geographic regions is interesting for possible acoustic clues to both stock and taxonomic identities. 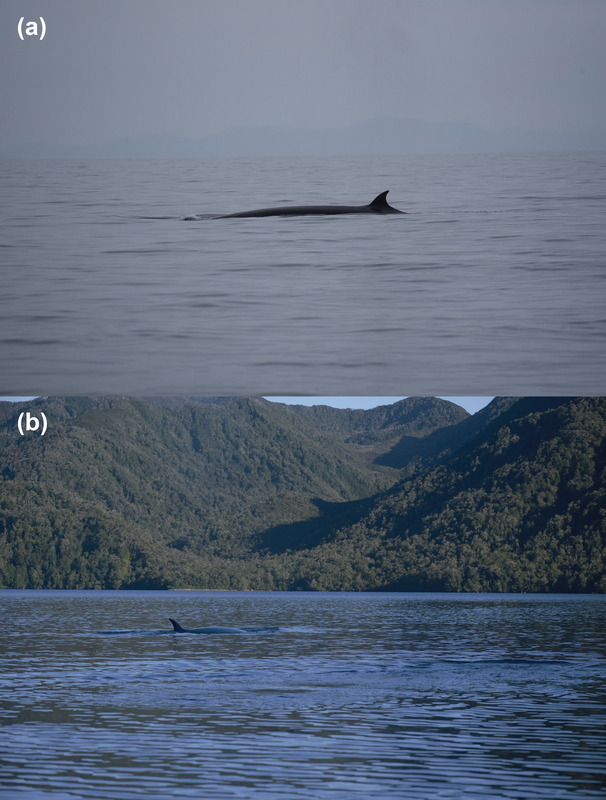 Consequently, the aim of this work is to describe sei whale vocalizations based on opportunistic recordings at the Penas Gulf, Chile, and to obtain a framework baseline regarding the characterizes of sei whales populations in the south-eastern Pacific Ocean. Two cruises to the Penas and Tres Montes gulfs (46.2–48.0∘ S, 74.0–75.4∘ W) aboard the motor sailing vessel Saoirse were carried out in May 2016 and May 2017, during which biological, oceanographic, and acoustics studies were carried out (Fig. 1). Marine mammals were identified visually with binoculars and the naked eye by a team of experienced marine mammal observers in the vessel. Figure 1Study area including sighting and recording locations. The whale tail indicates the area where sei whale were sighted and vocalizations were identified. Two different hydrophones were used for the recordings: an icListenHF hydrophone (sensitivity −171 dBV re 1 µPa with pre-amp; frequency response 10–200 kHz from Ocean Sonic, Canada) and a SoundTrap 202 STD hydrophone (sensitivity −205 dBV re 1 µPa; frequency response 60 000 Hz ±3 dB from Ocean Instruments, New Zealand). Also, we made stereo recordings on several occasions with an HTI-96-MIN hydrophone (flat frequency response from 0.02 to 30 kHz) connected to a handy recorder (H4nPro from ZOOM). Opportunistic and planned recordings were carried out depending on the weather conditions and the vessel location. In 2016, recordings were carried out for no longer than 1 day at each location where hydrophones were suspended over the side of the vessel. However, in 2017, at three different locations, hydrophones were also deployed between 2 and 5 days. In these cases, hydrophones were deployed at a depth of 5 or 10 m on rocky bottom with about 40 m bottom depth using a row with a mooring at the end and surface buoys on the opposite side. In both years, during the day or night, hydrophones were deployed at a depth of 5 and 10 m from the stationary vessel. Opportunistic recordings were continuous, but at night when the vessel was at anchor, the recordings were at intervals of 10–30 min each hour to guarantee the ability of the acoustic personnel to study the recording the next day. During all the recordings, the engine vessel was turned off. All the recordings were stored in the internal card memory of the equipment, and at the end of the day these were downloaded onto a portable computer. Audio data were analysed using the Raven Pro 1.5 (Cornell University, Ithaca, NY) software. Low and high frequency (Hz), frequency range (Hz), peak frequencies (the frequency at which the maximum power occurred within a call), and duration (s) for all calls found and attributed to sei whales were analysed from spectrograms and waveform plots created in Raven Pro 1.5 (Hann window; 50 % overlap; window size 14 563 samples; DFT 16 384 samples). Sei whales were sighted on both expeditions (2016 and 2017). In addition, during one day in 2017, humpback whales were sighted. Sound was recorded on 16 days in 2016 at 23 opportunistic recording locations and on 19 days at 24 locations in 2017. A total of 363 h was recorded between both expeditions; because the recordings were not continuous every day, this number is made up of 136 h (63 archives) in 2016 and 227 h (483 archives) in 2017. Recordings were not of the same duration or the same sampling rate because they were opportunistic. Sei whale calls were found in eight archives for 3 days (on 7 May 2016 and 10–11 May 2017) at two different locations (one in 2016 and other in 2017) (Table 1). In acoustic data from 2016, sei whale calls were detected when sei whales were sighted closer to the vessel (Fig. 2). In 2017, between 8 and 10 May, sei whales were sighted in the area after sei whale calls had been recorded (Fig. 2). Sei whale calls from 2016 were only recorded around midday, while in 2017 they were recorded in the late afternoon or at night (Table 1). Figure 2Photographed sei whale at Penas and Tres Montes gulfs on (a) 7 May 2016 (photo by Katie McConnell) and (b) 10 May 2017 (photo by Keri-Lee Pashuk). Table 1Sei whale recordings at Penas and Tres Montes gulfs. Only on two occasions were humpback whale sounds above 2000 Hz detected: in the rest of the analysed audios, only sei whale sounds were detected without associated calls. Only calls with high visual quality were measured. All vocalizations reported in this study were identified as downsweep calls (Fig. 3). We identified a total of 41 calls: 5 calls in 2016 and 36 in 2017. In 2016, calls ranged from an average maximum frequency of 105.3 Hz (SD = 18.3 Hz) down to an average minimum frequency of 35.6 Hz (SD = 4.6 Hz) over 1.6 s (SD = 0.1 s) with a peak frequency of 65.4 Hz (SD = 14.1 Hz) (Table 2). In 2017, calls ranged from an average maximum frequency of 93.3 Hz (SD = 10.9 Hz) down to 42.2 Hz (SD = 5.6 Hz) over 1.6 s (SD = 0.3 s) with a peak frequency of 68.3 Hz (SD = 14.2 Hz). The minimum frequency was 30 Hz and the maximum frequency was 129.4 Hz. Calls occurred in pairs (n=12), singles (n=5), or triplets (n=4) (Table 2). Figure 3Spectrogram of sei whale vocalization recorded with the hydrophone (32768 FFT, Hamming window). (a) Five-second spectrogram zoomed in on a pair of calls. (b) Five-second spectrogram of a pair of call. (c) A pair and a single sei whale call within 15 s.
Table 2Comparison of the frequency and timing of recorded calls of sei whales in the present study with studies in other areas. Values are mean value ± standard deviation. ND: no data (the study did not include that information). Given that recordings from this project were opportunistic, and without digital acoustic recording tags (DTAGs) deployed in sei whales, we cannot prove the origin of the calls. However, we can confirm with reasonable certainty that vocalizations recorded off Penas and Tres Montes gulfs were produced by sei whales, due to the sightings of this species during the recordings and the expeditions. Blue whales (Balaenoptera musculus), fin whale (Balaenoptera physalus), or minke whales (Balaenoptera acutorostrata) produce downsweep as well (Thompson et al., 1996; Schevill and Watkins, 1972; Watkins, 1981). Bryde's whales (Balaenoptera brydei) also have several call types, including downsweep, but they inhabit tropical and subtropical waters, and we do not have any record in this area yet (Omura, 1959; Wade and Gerrodette, 1993; Oleson et al., 2003). Generally, fin whales' downsweep has initial frequencies below 35 Hz and final frequencies around 20–18 Hz (Watkins, 1981), similar to minke whales but with shorter durations (0.2–0.3 s) and higher frequencies (130–60 Hz) (Schevill and Watkins, 1972). Minke whales in the North Atlantic produce long pulse trains (Mellinger et al., 2000). These were not recorded in this area. Fin and minke whale downsweep is definitively different from our recordings. Only downsweeps from blue whales described in Chile, through the DTAG data, has a lower peak frequency and duration; the minimum frequency of blue whales is higher than that in our results, and downsweep had been accompanied by the south-east Pacific signal type 2 (SEP2) (Saddler et al., 2017), supporting our results that our records are really from sei whales. In addition, the sei whale vocalizations described here show very similar characteristics to those described off the Azores by Romagosa et al. (2015), off New England by Baumgartner et al. (2008), and off Hawai'i by Rankin and Barlow (2007). In these areas, sei whale vocalizations are characterized by low-frequency downsweeps. However, sei whale sweeps recorded off Nova Scotia by Thompson (1979) and Knowlton et al. (1991) or in Antarctic waters by McDonald (2005) and Gedamke and Robinson (2010) are different from our recording and are characterized by higher frequencies. Rankin and Barlow (2007) describe two ranges for the low-frequency downsweeps (100–44 and 39–21 Hz) with durations of 1.0 and 1.3 s, respectively. In the present study, the minimum frequency was 30 Hz, being the average calls in the upper range defined by those authors. The range of frequencies described here is similar to what Baumgartner et al. (2008), Newhall et al. (2012), and Romagosa et al. (2015) reported, although the maximum frequency reported in the present study is higher. The higher-frequency calls recorded in the North Pacific (Hawai'i) and in the present study are similar, but our results showed higher frequencies in the top range (maximum of 111.4 vs. 129.4 Hz) and a longer duration (maximum 1.27 vs. 2.27 s). The similarities could be expected due to the possibility of there being a stereotypical call used in feeding grounds, as suggested by Romagosa et al. (2015). However, sei whales recorded in this study have shown a different call with higher frequencies and longer durations than those detected from North Atlantic or North Pacific waters. In the sub-Antarctic Auckland Islands, a series of four calls is predominant (Calderan et al., 2014), but the calls recorded at Penas Gulf occurred principally in pairs, although single calls and triplets were also detected. During this study, no four-call series were recorded as has been done in the North Atlantic or Pacific waters (Baumgartner et al., 2008; Newhall et al., 2012; Romagosa et al., 2015). Sei whale calls from Antarctic waters are characterized by broadband, tonal, frequency-modulated vocalizations between 100 and 600 Hz with durations between 1 and 3 s (McDonald, 2005; Gedamke and Robinson, 2010). These calls do not present similarities with the calls recorded here. This may be due a geographic separation of the populations, suggesting that different sei whale populations produce different stereotypical calls. The structure of the calls of sei whales is more variable between different whales than amongst the calls by an individual whale (Baumgartner et al., 2008). This suggests that sei whales present in Antarctic waters do not transit through southern Chile, or at least near the shore of Patagonia, in their migration to the breeding grounds in lower latitudes. Thus, the sei whales found in Chile, near the shore in Penas and Tres Montes gulfs, might represent a different population. As recordings were opportunistic, the duration of recordings was variable, and this maybe influenced the few calls that we recorded, so visual observations, tagging efforts, and genetic studies are needed to verify this hypothesis. In the present study, most acoustic activity was recorded during the night, while Baumgartner and Fratantoni (2008), Newhall et al. (2012), and Romagosa et al. (2015) recorded calls mostly during the day. These darkness patterns coincide with results from humpback whale songs reported from Chile (Español-Jiménez and van der Schaar, 2018). However, low-frequency sei whale downsweeps may have a different function from the stereotyped humpback vocalizations considered as songs (Edds-Walton, 1997). Though the behaviour of sei whales is poorly studied, most studies on this species state that sei whales prefer offshore waters, but these new records and sightings along the coast of Penas and Tres Montes gulfs (Aguayo-Lobo, 1974; Pastene and Schimada, 1999; Häussermann et al., 2017) demonstrated a wide habitat range, with the whales probably following productive feeding areas. If this is true, it is reasonable to assume that the calls of sei whale are influenced by the feeding conditions (as proposed by Baumgartner and Fratantoni, 2008) and have communicative functions, e.g. cooperatively searching for prey as suggested Newhall et al. (2012). Baumgartner and Fratantoni (2008) hypothesize that calling rates are reduced at night while the whales are feeding but increase with social activity during the day when copepods are either more difficult or less efficient to capture at depth. Our data could not support this hypothesis since calls were recorded at night, and it was not possible to observe what activities the whales were engaged in. Another factor that could be important in the discussion about the acoustic behaviour is background noise, which might be masking biologically important signals and impede the communications between individuals (Clark et al., 2009). This new description of sei whale calls adds knowledge to the vocalizations and distribution of an endangered species (IUCN, 2018) red-listed under criteria A-1. It is also listed in Appendix I (“Endangered migratory species”) and II (“Migratory species with unfavorable conservation status which require international agreements for their conservation and management”) of the Convention on the Conservation of Migratory Species of Wild Animals (Bonn Convention, 1979). Satellite tracking of the Chilean sei whale population, individual photo identification, distribution, and characteristics of the prey species, behavioural, genetic, and oceanographic studies are necessary to test some hypotheses and improve our understanding of this species. The data are accessible by contacting the authors. This research would not have been possible without the assistance of Keri-Lee Pashuk and Greg Landreth of Patagonia Projects who organized the funding and operations of expedition vessel SRV Saoirse supporting the HF29 and HF32 expeditions; in addition, we want to thank Michael Kean, Gastón Herrera, Sebastián Durán, Cristian Santana, Valentina Molinos; Mark Woods of Ocean Sonic and Daniel Zitterbart for providing hydrophones; and John Atkins at Ocean Instruments for help in the configurations. These expeditions were funded by the Blue Marine Foundation, Global Marine Networks (USA); Iridium Communications Inc.; and Deep Trekker Inc (Canada), MERI Foundation, Huinay Foundation and Fondecyt project no. 1161699. We are very grateful to Alessandro Bocconcelli and Joe Warren for their feedback on this research, also to the anonymous referee. This is publication no. 161 of Huinay Scientific Field Station. Paulina Bahamonde is supported by Nucleo Milenio INVASAL funded by Chile's government program, Iniciativa Cientifica Milenio from Ministerio de Economia, Fomento y Turismo. 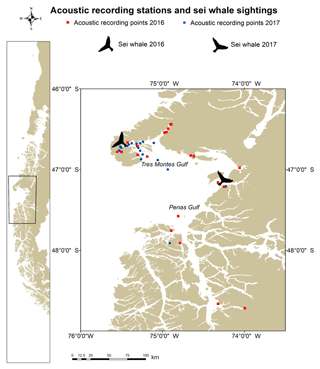 Acevedo, C., Aguayo-Lobo, A., González, A., Haro, D., Olave, C., Quezada, F., Martínez, F., Garthe, S., and Cáceres, B.: Occurrence of sei whales (Balaenoptera borealis) in the Magellan Strait from 2004–2015, Chile, Aquat. Mamm., 43, 63–72, 2017. Aguayo-Lobo, A.: Baleen whales of continental Chile, in: The Whale Problem: A Status Report, edited by: Schevill, W. E., Harvard University Press, Harvard, 209–217, 1974. Aguayo-Lobo, A., Torres, D., and Acevedo J.: Los mamíferos marinos de Chile: I. Cetacea, Serie Científica INACH, 48, 19–159, 1998. Baker, C. S., Dalebout, M. L., Funahashi, N., Ma, Y. U., Steel, D., and Lavery, S.: Market surveys of whales, dolphins and porpoises in Japan and Korea, 2003–2004, with reference to stock identity of sei whales, Paper SC/56/BC3 presented to the IWC Scientific Committee, available from the IWC Office, June 2004 (unpublished). Baumgartner, M. F. and Fratantoni, D. M.: Diel periodicity in both sei whale vocalization rates and the vertical migration of their copepod prey observed from ocean gliders, Limnol. Oceanogr., 53, 2197–2209, 2008. Baumgartner, M. F., Van Parijs, S. M., Wenzel, F. W., Tremblay, C. J., Carter Esch, H., and Warde, A. M.: Low frequency vocalizations attributed to sei whales (Balaenoptera borealis), J. Acoust. Soc. Am., 124, 1339–1349, 2008. Calderan, S., Miller, B., Collins, K., Ensor, P., Double, M., Leaper, R., and Barlow, J.: Low-frequency vocalizations of sei whales (Balaenoptera borealis) in the Southern Ocean, J. Acoust. Soc. Am., 136, 418–423, 2014. Clark, C. W. and Ellison, W. T.: Numbers and distributions of bowhead whales, Balaena mysticetus, based on the 1986 acoustic study off Pt Barrow Alaska, Report of the International Whaling Commission, 39, 297–303, 1989. Clark, C. W., Ellison, W. T., Southall, B. L., Hatch, L., Van Parijs, S. M., Frankel, A., and Ponirakis, D.: Acoustic masking in marine ecosystems: Intuitions, analysis, and implication, Mar. Ecol. Prog. Ser., 395, 201–222, 2009. Donovan, G. P.: A review of IWC stock boundaries, International Whaling Commission, Special Issue, 13, 39–68, 1991. Edds-Walton, P. L.: Acoustic communication signals of mysticete whales, Bioacoustics, 8, 47–60, 1997. 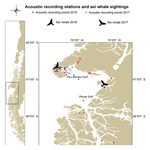 Español-Jiménez, S. and van der Schaar, M.: First record of humpback whale songs in Southern Chile: Analysis of seasonal and diel variation, Mar. Mam. Sci., 34, 718–733, 2018. Findlay, K., Pitman, R., Tsurui, T., Sakai, K., Ensor, P., Iwakami, H., Ljungblad, D., Shimada, H., Thiele, D., Van Waerebeek, K., Hucke-Gaete, R., and Sanino-Vattier, G. P. :1997/1998 IWC-Southern Ocean whale and ecosystem research (IWC/SOWER) blue whale cruise, Chile, Report presented to the International Whaling Commission, Muskat, Oman, 1998. Gallardo, V. A., Arcos, D., Salamanca, M., and Pastene, L. A.: On the occurrence of Bryde's whale (Balaenoptera edeni Anderson 1878) in an upwelling area off Central Chile, Report of the International Whaling Commission, 33, 481–488, 1983. 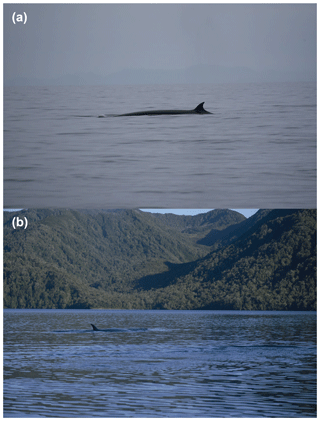 Gambell, R.: Seasonal cycles and reproduction in sei whales of the Southern Hemisphere, Disc. Rep., 35, 31–134, 1968. Gambell, R.: A review of population assessments of Antarctic sei whales, Report of the International Whaling Commission, Special Issue, 1, 44–49, 1974. Gambell, R.: Sei whale, Balaenopera borealis, Lesson 1828, in: Handbook of Marine Mammals, Volume 3, The Sirenian and Baleen whales, edited by: Ridgway, S. H. and Harrison, R., Academic Press, London, 369 pp., 1985. Gedamke, J., and Robinson, S. M.: Acoustic survey for marine mammal occurrence and distribution off East Antarctica (30–80∘ E) in January–February 2006, Deep-Sea Res. Pt. II, 57, 968–981, 2010. Guzmán, A.: Avistamientos de ballena azul Balaenoptera musculus (Linnaeus, 1758) y sei B. borealis Lesson 1828 en la costa nor-occidental de la isla de Chiloé, Chile (Blue whale Balaenoptera musculus (Linnaeus, 1758) and sei whales B. borealis Lesson, 1828 sightings in the north-occidental coastal in the Chiloé islands, Chile), Boletín del Museo Nacional de Historia Natural, Chile, 55, 51–60, 2006. Häussermann, V. Gutstein, C. S., Bedington, M., Cassis, D., Olavarria, C., Dale, A. C., Valenzuela-Toro, A. M., Perez-Alvarez, M. J., Sepúlveda, H. H., McConnell, K. M., Horwitz, F. E., and Försterra, G.: Largest baleen whale mass mortality during strong El Niño event is likely related to harmful toxic algal bloom, PeerJ, 5, e3123, https://doi.org/10.7717/peerj.3123, 2017. Horwood, J. W.: The sei whale: Population biology, ecology and management, Croom Helm, London, 1987. Horwood, J. W.: Sei whale Balaenoptera borealis, in: Encyclopedia of marine mammals, edited by: Perrin, W. F., Würsig, B., and Thewissen, J. G. M., Academic Press, San Diego, 1352 pp., 2002. Huijser, L. A., Bérubé, M., Cabrera, A. A., Prieto, R., Silva, M. A., Robbins, J., Kanda, N., Pastene, L. A., Goto, M., Yoshida, H., Víkingsson, G. A., and Palsboll, P. J.: Population structure of North Atlantic and North Pacific sei whales (Balaenoptera borealis) inferred from mitochondrial control region DNA sequences and microsatellite genotypes, Conserv. Genet., 19, 1007–1024, 2018. IUCN: The IUCN Red List of Threatened Species, Version 2018-1, 2018. Jefferson, T. A., Webber, M. A., and Pitman, R. L. (Eds. ): Marine mammals of the world: A comprehensive guide to their identification, Academic Press, San Diego, 616 pp., 2008. Jonsgård, Å. and Darling, K.: On the biology of the eastern North Atlantic sei whale, Balaenoptera borealis Lesson, Reports of the International Whaling Commission, 1, 124–129, 1977. 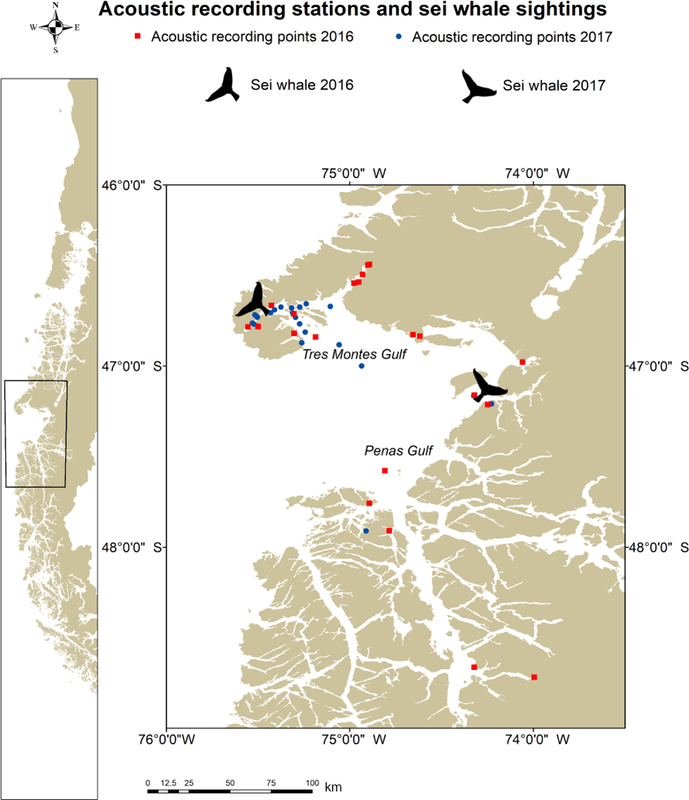 Kanda, N., Goto, M., and Pastene, L. A.: Genetic characteristics of western North Pacific sei whales, Balaenoptera borealis, as revealed by microsatellites, Mar. Biotechnol., 8, 86–93, 2006. Knowlton, A., Clark, C. W., and Kraus, S. D.: Sounds recorded in the presence of sei whales Balaenoptera Borealis, Abstract Book of The Ninth Biennial Conference on the Biology of Marine Mammals, 5–9 December, Chicago, Illinois, USA, 1991. Lockyer, C.: Some possible factors affecting the age distribution of the catch of sei whales in the Antarctic, Reports of the International Whaling Commission, Special Issue, 1, 63–70, 1977. Mackintosh, N. A.: The southern stocks of whalebone whales, Disc. Rep., 22, 197–300, 1942. McDonald, M. A., Hildebrand, J. A., Wiggins, S. M., Thiele, D., Glasgow, D., and Moore, S. E.: Sei whale sounds recorded in the Antarctic, J. Acoust. Soc. Am., 118, 3941–3945, 2005. Mellinger, D. K., Carson, C. D., and Clark, C. W.: Characteristics of minke whale (Balaenoptera acutorostrata) pulse trains recorded near Puerto Rico, Mar. Mammal Sci., 16, 739–756, 2000. Newhall, A. E., Lin, Y.-T., Lynch, J. F., Baumgartner, M. F., and Gawarkiewicz, G. G.: Long distance passive localization of vocalizing sei whales using an acoustic normal mode approach, J. Acoust. Soc. Am., 131, 1814–1825, 2012. Oleson, E. M., Barlow, J., Gordon, J., Rankin, S., and Hildebrand, J. A.: Low frequency calls of Bryde's whales, Mar. Mammal Sci., 19, 160–172, 2003. Omura, H. and Nemoto, T.: Sei whales in the adjacent waters of Japan, III, Relation between movement and water temperature, Reports of the International Whaling Commission, Special Issue, 10, 79–87, 1955. Omura, H.: Bryde's whale from the coast of Japan, The Scientific Reports of the Whales Research institute, 14, 1–33, 1959. Pastene, L. A. and Shimada, H.: Report of a sighting survey in Chile's exclusive economic zone with comments on sei whale distribution, Anales del Instituto de la Patagonia, Serie Ciencias Naturales (Chile), 27, 51–62, 1999. Perry, S. L., DeMaster, D. P., and Silber, G. K.: The great whales: history and status of six species listed as endangered under the U.S. Endangered Species Act of 1973, Mar. Fish. Rev., 61, 1–74, 1999. Prieto, R., Janiger, D., Silva, M. A., Waring, G. T., and Gonçalves, J. M.: The forgotten whale: A biblio-metric analysis and literature review of the North Atlantic sei whale Balaenoptera borealis, Mammal Rev., 42, 235–272, 2011. Rankin, S. and Barlow, J.: Vocalizations of the sei whale Balaenoptera borealis off the Hawaiian Islands, Bioacoustics, 16, 137–145, 2007. Richardson, W. J., Greene, C. R. J., Malme, C. I., and Thomson, D. H.: Marine mammals and noise, in: Measurement procedures, Academic Press, San Diego, CA, 576 pp., 1995. Reeves, R. R., Silber G., and Payne, P. M.: Draft recovery plan for the fin whale Balaenoptera physalus and sei whale Balaenoptera borealis, prepared for the Office of Protected Resources, National Marine Fisheries Service, Silver Spring, MD, 1998. Reeves, R. R., Stewart, B. S., Clapham, P. J., and Powell, J. A. (Eds. ): Marine mammals of the world, Alfred A. Knopf/Chanticleer Press, New York, 2002. Rice, D. W.: Marine mammals of the world: Systematics and distribution, (Special Publication Number 4), The Society for Marine Mammalogy, Lawrence, 231 pp., 1998. 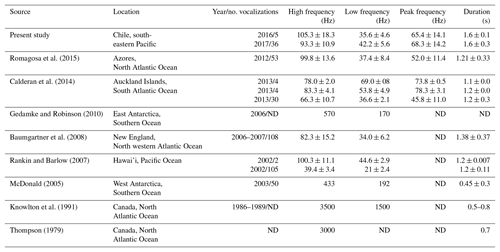 Romagosa, M., Boisseau, O., Cucknell, A. C., Moscrop, A., and McLanaghan, R.: Source level estimates for sei whale (Balaenoptera borealis) vocalizations off the Azores, J. Acoust. Soc. Am., 138, 2367–2372, 2015. Saddler, M. R., Bocconcelli, A., Hickmott, L. S., Chiang, G., Landea-Briones, R., Bahamonde, P. A., Howe, G., Segre P. S., and Sayigh, L. S.: Characterizing Chilean blue whale vocalizations with DTAGs: a test of using tag accelerometers for caller identification, J. Exp. Biol., jeb-151498, https://doi.org/10.1242/jeb.151498, 2017. Schevill, W. E. and Watkins, W. A.: Intense low-frequency sounds from an Antarctic minke whale, Balaenoptera acutorostrata, Breviora, 388, 1–8, 1972. Schlatter, R.: Avistamientos de mamíferos marinos durante SIBEX-Fase 2, en el estrecho de Bransfield y aguas adyacentes (Sightings of marine mammals during SIBEX-Phase 2, in the Bransfield Strait and adjacent waters), Serie Científica INACH, 36, 167–174, 1987. Thompson, T. J., Winn, H. E., and Perkins, P. J.: Mysticete sounds, in: Behaviour of Marine Mammals, Cetaceans, edited by Winn, H. E. and Olla, B. L., Plenum, New York, 3, 403–431, 1979. Thompson, P. O., Findley, L. T., and Vidal, O.: Underwater sounds of blue whales, Balaenoptera musculus, in the Gulf of California, Mexico, Mar. Mammal Sci., 12, 293–296. 1996. Tonnessen, J. N. and Johnsen, A. O.: The history of modern whaling, University of California Press, Berkeley, California, 798 pp., 1982. Valdivia, J., Ramirez, P., and Franco, F.: The exploitation of Bryde's whales in the Peruvian Sea, Report of the International Whaling Commission, 31, 441–448, 1981. Wade, P. R. and Gerrodette, T.: Estimates of cetacean abundance and distribution in the Eastern Tropical Pacific, Report of the International Whaling Comission, 43, 477–493, 1993. Watkins, W. A.: Activities and underwater sounds of fin whales, Sci. Rep. Whales Res. Inst., 33, 83–117, 1981.